Where do all those socks go, the ones that disappear in the washing machine? 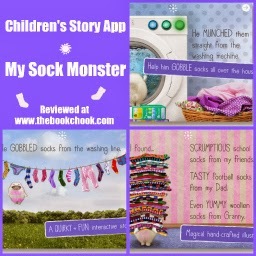 Kids will have fun finding an answer in the story app, My Sock Monster. What I like: I enjoyed the whimsy built into the app. When sock monster eats a green striped sock, his fur turns green-stripey. He loves socks straight from the washing machine, and kids can help him push buttons on the machine. He doesn’t much like stinky socks - and children will chortle over the noise each stinky sock makes! There’s also a little spider and bumble-bee that appear and disappear. The storyline is simple, and that works well with just the right amount of interactivity. I very much appreciate that the app has no third-party ads or in-app purchases. Does anyone with kids really want these? Am I greedy? Yes! It would be great if the app had the function where kids could also take a “photo” of the little sock monster, or put their faces into a sock monster template.